The Spanish Revival kitchen concept was inspired by tourism in southern Spain during the 1920s, and soon evolved in western parts of the United States with Spanish Revival homes built. The style stands out with details such as high ceilings, rustic color schemes, and use of natural materials such as wood and wrought iron. Many Spanish Revival kitchen designs feature elements from or inspired by Spain such as paint finishes and inlays. Traditional Spanish style kitchens feature intricate architectural designs inspired by Spanish colonies. While the design has a long history, the more you learn about it, the easier it gets to create the vision you want for your kitchen space. Here are a few Spanish Revival design ideas to consider. Use dark, vibrant colors for cabinetry such as walnut, Mahogany, or ebony finish for an antique look. Cabinets with Spanish influence feature unique decorative trim such as beading or rope for added detail. Play with color schemes to create an inviting atmosphere such as blues, browns, greens, and off-white with tile or stone flooring featuring reds and oranges. Enhance kitchen backsplash with hand-painted tile or tiles featuring Spanish-inspired patterns. The color detail highlighted in the tiles may match or complement other elements of your kitchen such as nobs, fixtures, or flooring. Decorative tile with variations in textures and inspired Spanish Catalina designs with refined finishing touches featuring a gloss or matte coating creating colorful, stunning effects. Insert wrought iron elements such as island pendants for stylish lighting or high-ceiling accessory. Use wrought iron work as a cabinet insert or lateral wall space embellishment. Give countertops a distinctive flair by incorporating stone or granite into your design. Choosing the type of material such as stone, marble, quartz, or granite adds dramatic contrast to the kitchen atmosphere. Whether you want to create an aged or contemporary feel, there are plenty of options to satisfy your interests. Black stone and beige granite are popular options. Give walls a warm look with solid colors such as gold or orange. Consider enhancing their look with texture such as stucco or add natural wood trimming for depth. 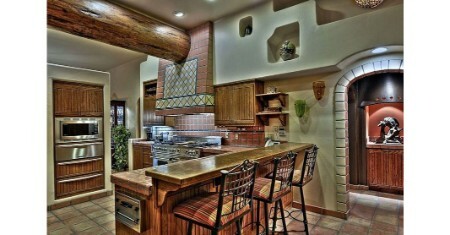 For high-ceilings add wood beams. Pots, planters, and vases featuring natural textures enhance Spanish wall décor. Try a copper sink for a vintage look. Similar hardware elements such as faucets may benefit from oil-rubbed bronze finishing for a subtle, preserved look. Explore Spanish-inspired accents including Spanish furniture pieces, stained glass windows, steel lampshades, iron door handles, Terracotta pottery, and carved wood pieces such as sideboards and rush seat stools for kitchen islands. Infuse your kitchen with Spanish style to complete the perfect Spanish Revival design for your home. Give your kitchen personality by adding Spanish influence based on lifestyle interests. Use classic design details with natural elements to create a warm and welcoming place with a modern twist to complete your space.